A quintessential brunch recipe – these Asian spiced breakfast sausages are spiced with Szechuan peppercorn and a mix of other spices. They are easy to make with ground pork or chicken, and can be made ahead of time and frozen too. It’s no secret that I love brunch and would turn any meal into a brunch special, given the opportunity. Mr K and I have now gotten into the habit of having brunch almost every weekend. They vary from the quick and lazy, to the well thought out brunches on special occasions. These Asian Spiced Breakfast Sausages truly are the poster child of brunch! I first shared this recipe in 2015. But two years on, it’s time to give this brunch mainstay of ours a new makeover with new pictures AND a recipe video as well! 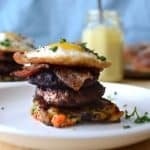 Originally, this post was for Asian spiced breakfast sausages and bubble and squeak (potato cakes) stacks. 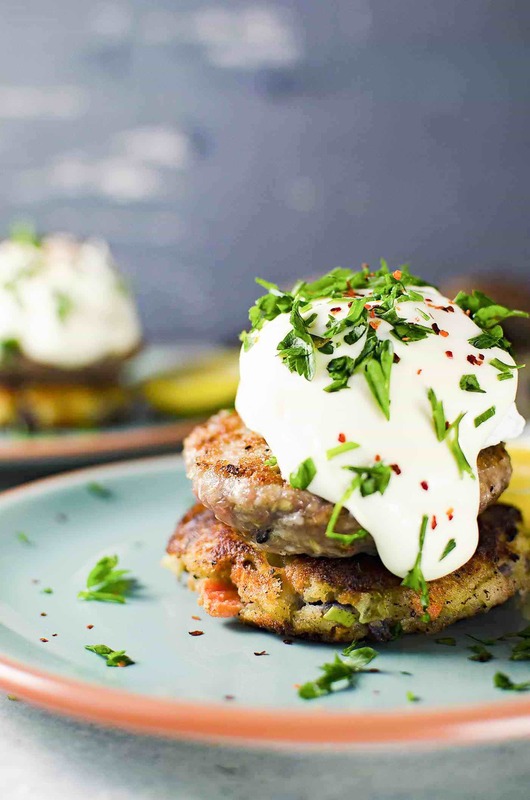 You can still find the recipe (and video) for bubble and squeak right here. These Asian spiced breakfast sausages are very easy to make. You can also make them the day before and then heat up in the oven for fast and easy brunch entertaining. Or store in the freezer for up to a week. And if you’re making them for a special occasion (Valentine’s day, birthdays, or just a regular weekend off), you could pair this meal with a lovely fruity and refreshing drink like my sparkling blueberry elderflower sour and then maybe follow it up with a simple summery dessert, like these peach and raspberry popsicles? 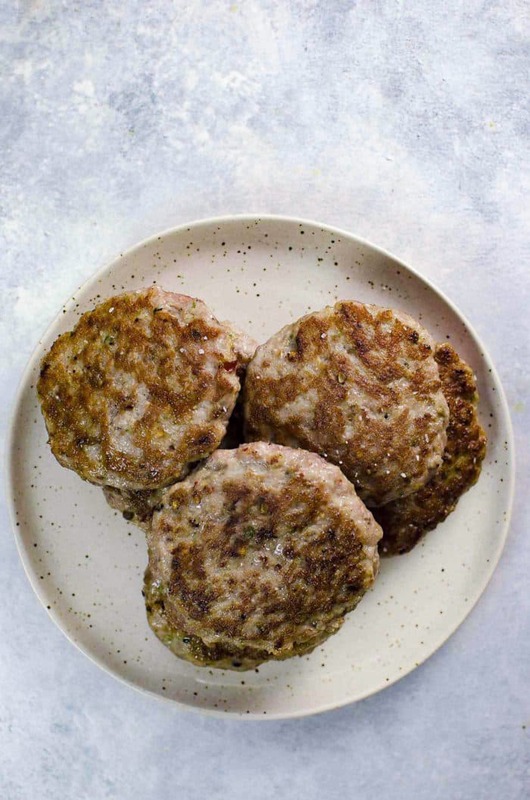 These breakfast sausages are made with ground (minced) pork, but you can also use ground chicken. The incredible flavor comes from that spice mix which contains the one-of-a-kind szechuan peppercorn, garlic, ginger, green onions, soy sauce and a touch of sugar. If you can’t find authentic szechuan peppercorn, you can substitute with black peppercorn. The flavor will certainly be different, but delicious nonetheless! Also, remember that good, authentic szechuan peppercorn has an intense flavor with an amazing aroma, so a pinch goes a very long way. A little too much and you’ll end up numbing your whole mouth and palate. I made fairly large sausage patties, but you’re more than welcome to change the size or shape to your preference. I topped them with kewpie mayonnaise, but feel free to use regular mayonnaise or hollondaise sauce instead. We usually pair these Asian spiced breakfast sausages with bubble and squeak that’s made with potatoes and colorful veggies. But go ahead and serve these up any way you like. 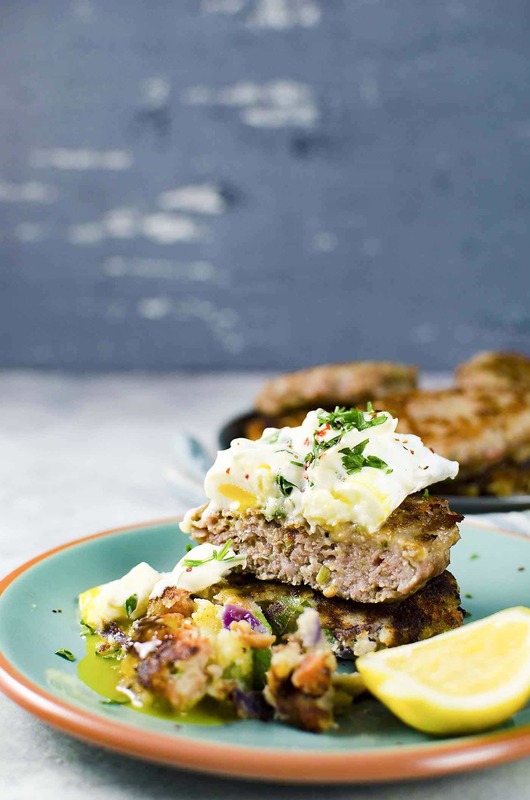 No matter how you serve them, these breakfast sausages are a winner. 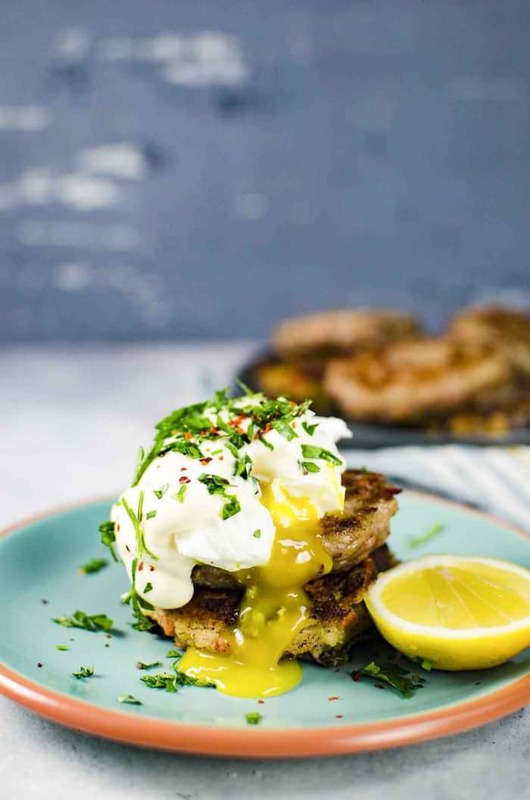 It’s moist, flavorful and I topped it with a perfectly poached egg, with a beautifully golden and runny egg yolk. The stuff of brunch heaven in other words. Place all the ingredients (except for the ground pork) in a spice grinder and pulse until you get a smooth spice paste. Add the spice paste to the ground pork. Mix well to incorporate the spices into the meat. Optional - let the meat marinate (in a covered bowl) for about an hour. Using a scoop, portion out 6 - 8 servings of the ground meat. Using wet hands, shape the ground meat into a patty. Heat up an oiled non-stick pan on medium - medium high heat to cook the patties. Or heat up the grill to medium high heat. Grill the sausage patties 4 - 5 minutes per side, until they are golden brown. Leave them in the oven to keep them warm, if you're serving them soon. FREEZE FOR LATER - wrap the cooked and cooled down sausage patties with freezer paper or parchment paper and freeze in resealable bags. Heat in the microwave for a couple of minutes (until hot), when you're ready to eat. Enjoy! If you liked this Asian spiced breakfast sausages recipe, don’t forget to subscribe for new (and free) recipes by entering your email address on the side bar (and get all these recipes delivered straight to your inbox), so you don’t miss out on a thing. You can find me on FACEBOOK, TWITTER, INSTAGRAM, PINTEREST, YOU TUBE and GOOGLE-PLUS too. Both recipes sound delightful, and I can’t wait to try them out. This is MY kind of breakfast! Complex flavors and completely satisfying! Yum! This looks incredibly good and I love the spice mix in the sausage. Beautiful. This sounds so good. My hubby and I love spicy foods and especially breakfast meats. Since Nana will be watching the kids this weekend, I’ll have plenty of time to whip this up. 🙂 Thanks for linking up to the Bloggers Brags Pinterest Party. I have pinned to the Bloggers Brags Broad and I’ll be sharing this recipe on my FB tomorrow. Loving this! those patties look great! It looks soooo yummy Dini, I don’t often make brunch but might have to make the exception here! So glad to hear you have tried it!! 😀 Thank you so much for visiting my blog and letting me know how it went! Must say, my mouth is absolutely watering. Minced meat with those kinds of Asian spices are right up my street. Definitely going to try this with an egg – i love mine crispy on the edges and soft on the inside too!! I feel like as humans we are biologically pre-disposed to love foods that are crispy on the outside and bordering on underdone on the inside, right? Steak? Fries/chips? Cookies? Woah! MIND. BLOWN!! I never realized that 😀 you are absolutely right! Thank you Mandi 🙂 The spices smell absolutely beautiful and I hope you try it! I cannot get over how amazing this dish sounds! Everything from the delicious flavour combinations to the gorgeous texture variations just makes me want to run into the kitchen right now and make it! hahaha!! Thank you Nicola! It was definitely delicious 🙂 I’m making the bubble & squeak again this weekend too!